CCI stands for Commodity Channel Index and it is a popular oscillator among Forex traders. It can be used on any financial instrument if there is a technical chart available as the interpretation is the same. Being an oscillator, it is applied below the actual chart, in a separate window, and it can be edited in such a way to fit everyone's needs. The standard or default value offered by the MetaTrader is 14, and this means it considers fourteen candles before plotting a value in the designated window. It travels in both negative and positive territory. Most oscillators have either positive (like the RSI – Relative Strength Index) or negative values (William Percentage Range, for example), but not this one. The implicit values are -100 and +100. However, these are not boundaries or maximum levels like in other oscillators case. On strong moves, the price is traveling way beyond the 100 or -100, and therefore it is difficult to find overbought and oversold levels with it. It is extremely volatile. For an oscillator, it is a volatile indicator. Not all of them are, but this one will travel from +100 to -100 on the actual price doing nothing at all. Despite having so many things to consider, the CCI gained in popularity and it is now being used not only by equity traders but by currency ones as well. It shows the difference between the actual price of a currency pair and its SMA (Simple Moving Average) and the outcome is divided by its standard deviation. Sounds complicated? Well, we're not supposed to know how it is calculated, but how to trade with it, as the trading platform is plotting the values automatically. 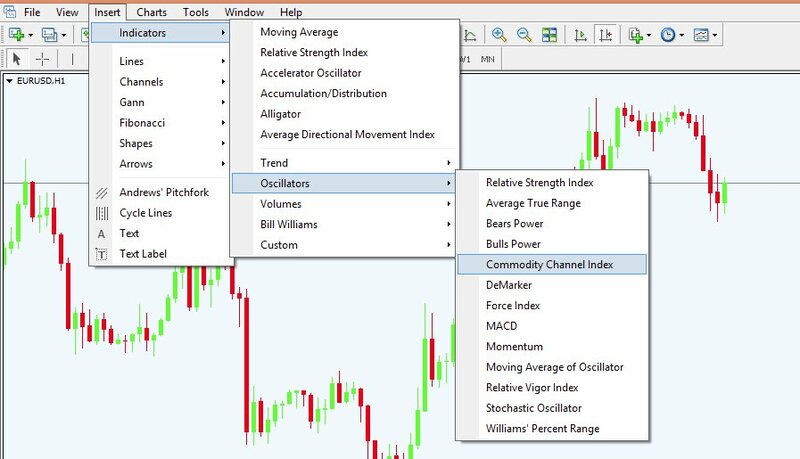 The MetaTrader(MT4) is offering the indicator under the following path: Insert/Indicators/Oscillators and the list that appears contains the CCI too. Self-explanatory and easy to place on any chart, the CCI will end up showing a line that travels between the -100 and 100 levels but not only. One way to trade with this oscillator is to look for divergences that may appear between price and the CCI. As always, traders should stay with the oscillator because it considers multiple candles before plotting a value, not to mention the fact that the result is filtered too. A divergence is defined when price and oscillator are not doing similar moves anymore. To be more exact, if the price is making two lower-lows and the oscillator is not confirming the second one, it is being said that a bullish divergence between price and oscillator appeared. The same is valid when the price is forming two higher-highs but the CCI is not confirming the second high. A bearish divergence is in place and traders will look for selling the currency pair. A typical bullish divergence appeared in the chart above, as it can be seen that the CCI did not confirm the two lower lows price made. As such, a reversal pattern formed and the right thing to do is to go long or to buy the currency pair. Unfortunately, at least when it comes to the CCI (as it is extremely volatile), this approach works only to some extent. That is when the market is ranging. Ranges are forming for various of reasons, the typical one being low volatility at one moment of time during a trading session. The Asian session is one with low volatility and market mostly ranges. Therefore, this approach works in most of the Asian session. When compared with other oscillators that have a fixed range to travel (the RSI travels between 0 and 100, with the extremes being rarely touched if ever, the CCI goes beyond the implicit -100 and +100 levels. This makes catching strong trends possible and in the CCI to be used as a trend indicator, even though we all know by now that it is an oscillator. To do that, the 0 level can be used. When the oscillator is traveling from below -100 to over +100, we may not catch the absolute reversing value, but the CCI starts the move even before the price reversal to begin. Remember the statement from the start of this article? The CCI is traveling between its values even when the price is in a range. The idea behind treating the CCI as a continuation pattern is to sell when it crosses the level on its way below the -100 and to buy when it is crossing it in a bullish trend. While it seems like a simple approach, it works especially if the timeframe is a big one. The example above shows the sell signal or the cross between the CCI and the zero-level happening when the price is almost at the top. This is a great signal to short and the oscillator is seeing the price fails to make a sustained move as it turns before the actual price doing that. A move back above the -100 will indicate an exit from the previous short position, and a further move crossing the zero level to the upside will represent the entry on a long trade. This time the new trade gives a nice profit as well, and just like that, one simple approach gave two great trades. The classical interpretation of the CCI is that it can be used to identify overbought and oversold levels, but this is a risky approach with this oscillator. The idea is to buy below -100 and sell above +100. While the approach has its logic, the price stays in these “so-called” overbought and oversold areas a lot of time. Not only that it stays like this, but it seems that the strongest trends and breaks are happening exactly when the CCI is overbought or oversold. To sum up, it is a great tool to be used for finding both reversals and continuation conditions, and avoiding its standard interpretation will save you from a lot of pain.